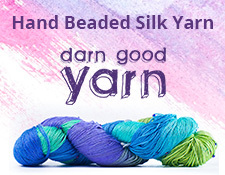 I am impressed with the service at Jimmy Beans Wool online store. More specifically, I’m impressed with their customer service. Last week I placed an order for some hard-to-find needles. No problem. Not long after I placed my order, I got a personal e-mail from one of their employees saying that one of the items I ordered was on backorder and that they wanted to know what I wanted to do. I sort of forgot about this until Sunday evening, when I e-mailed them back and told them to ship what they were able to. Less than five minutes later, I got another personal e-mail back saying it would ship that night. I know it was on a Sunday, but I assume it was taken to the shipping point at that time. All I can say is that I am happy with this company. I received the first part of my order yesterday, and the receipt was clearly outlined with what they still needed to ship me. And there was a handwritten smiley face on the receipt. Thank you, Jimmy Beans Wool. I will buy from you again.